Buying a boat to convert, especially a big old steel boat? 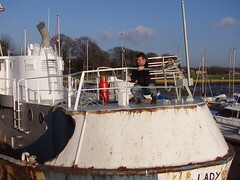 I had no boating experience at all before buying Lady Jane, had not even been to sea or driven a boat before. A ferry across to France and a few spins in a friend's yacht was about it for me. I've said several times that if I knew then what I now know, I would never have bought Lady Jane. Having said that, now I have her, I love both her and the lifestyle - including the hard work. I've found that in general, boating folks are great people and it is wonderful to be by the sea. Before buying a boat, my best advice would be to find a surveyor you feel you can trust and don't worry too much about how much you pay for a thorough out of the water survey of your intended. It will be worth it in the long run. I relied on a survey done for the previous owners, which I now realise was a terrible mistake. You may not like what the surveyor has to say, especially if you really like the boat and couldn't find anything else like her. If you do decide to buy the boat, at least you will have a reliable starting point and possibly more negotiating power over the seller. My biggest problems have been as a result of things I discovered only once I started, simply because I did not know any better at the time. For example, what rust looks like in all it's forms and how easily rust all the way through apparently good steel can remain hidden until you start to chip it. - see the back deck, fuel tank and stern accommodation entries. There seems to be all sorts of people who are only too happy to dispense advice, though in practice I've found many people don't know what they're talking about, and some are angling for work for themselves. No two people can seem to agree on paint systems for example. I've listened to many folks and made my own mind up based on what I've heard, internet research, trial and error and listening to the advice of the manufacturers. I do listen to what people have to say though, and distil out the useful stuff for myself. On that subject, I would say that people who really know their stuff are worth their weight in gold. Electrics - Wiring, invertors, generators etc. Consumables - fuel, oil, propane, oxygen, cleaning fluids etc. Tender/Rib - Fuel, oil, spares etc. At some point I'll have to spend money on a radar, depth finders, VHF radios etc, which I'm dreading. Oh yes and I've not really done anything about qualifications yet, which will no doubt incur a significant cost. One final point is the overall lifestyle - Although a lot of fun, it is a very committing project. Right now I'm spending up to three and a half days a week working on Lady Jane, with some evenings spent doing homework such as welding etc. I'm also planning on working down on the boat some evenings as well. This is hard on relationships, friends, other hobbies. I'm hoping at some point to be able to live on Lady Jane and rent out my house, this will save money/yield more money for the boat, and will also mean only one set of housework! Ok, I know I'm sounding negative here, but forewarned is forearmed. If you know about this stuff in advance then you are prepared for it. As I said, I love it and am really looking forward to having Lady Jane looking good when I finally take her out for a spin - hopefully late in the summer. As to sources of information - I've just bought Metal Boats by Bruce Roberts but have not had the time to read any of it yet. While the book is a little thinner than I was expecting for a book covering everything about metal boats, it does appear to be pretty good. The picture shows the stages in the making of my new workbench. This replaces the one I 'lost'. Now, hopefully, I can get going with finishing off the rest of Lady Jane's bow section. My thanks to Mary for her assistance putting it together on the platform, and sorry for the black paint all over your hands. I opted for black this time, simply because I could not find the blue paint until after I had started painting. You can be sure I'll take better care of this one. 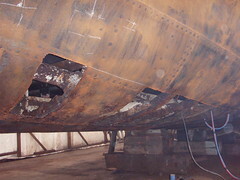 Work on the 'painting the hull' project is painfully slow, though at least progress is being made. I see I last posted about chipping the bow section over a month ago. It has been a combination of poor weather and the unfortunate loss of my workbench that has contributed to the slowdown on working on the hull. The black stretch you can see has just been wire brushed, and is now ready for priming. As soon as I have my new workbench operational and good weather on a week day, when I can make a noise, I'll also finish prepping the top bit. I must say that I'm really looking forward to the satisfaction of getting a coat of primer onto such a big section. I need to finish working near the bow as soon as possible, as the swans will be wanting to re-occupy their nest before too long. 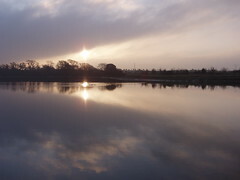 I'm reminded from time to time by folks that I take a lot of grim photos, so by way of a change I've posted a picture of Fareham creek, taken early on a frosty morning. I keep telling myself I should get out and take more 'proper' pictures as there are certainly no shortage of photo opportunities near Lady Jane. 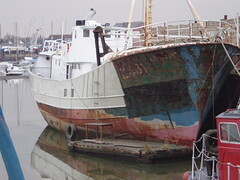 Hmm, maybe I'll put Baby Jane into the water and take a run down to Portsmouth with my camera sometime soon. There is one particular group of boats I've seen that I'd love to photograph on a good day. To generally brighten things up, I've also started posting 'found' photos on my blog. These I've stolen from elsewhere on the internets and think might be interesting to other people as well. Despite the problems elsewhere, I'm continuing to make progress in the aft accommodation space. It's amazing the difference a lick of paint makes. 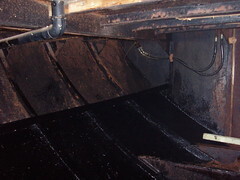 The picture shows the before and after effect of the bitumen paint I'm using. The rusty steel you see still needs scraping down and treating with Rustroy before I coat it with bitumen. It's not easy painting with black paint in such a dark space, plus with access to some areas being quite difficult, especially overhead, I find I get more paint on myself than I've so far managed anywhere else on Lady Jane. Getting black paint on myself is not particularly a problem, unless I miss a bit on my face before going down to the pub. I've known for a while that there is a section of the hull on the port side in the aft accommodation space that is very thin. It's where this big flake of rust was from. What I didn't know was just how thin it was. I've avoided doing any rust busting on this section, on purpose, but as part of prepping the steel for insulating the hull this section had to be attacked. 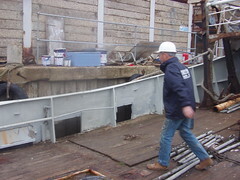 I started by asking Robin to weld over the worst spots which were below the waterline. Unfortunately, what should have been a straightforward piece of welding turned into a battle against a jet of seawater, as the welding rod went straight through the rust and paint on the hull. 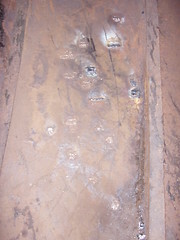 The picture shows the patches which have so far been welded. You can see the wet trace left by seawater which is still seeping in one spot. Now this sleeping dog has been woken, we need to spend some time working out what is going to be best to do from here. Obviously the first thing will be to rust bust the entire area with the tide out, then weld up the resulting holes for now. I've finally got around to doing some work on Lady Jane's main engine, which is a big old Industrie six cylinder diesel, complete with turbocharger and intercooler. 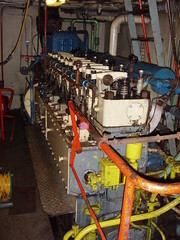 The main engine block, which you can see in the picture, is supported by a myriad of pipes, pumps and valves. These are, in turn, variously supported with backup systems. All in all making the engine room an 'interesting' place to work. What finally precipitated getting some work done was the fact that seawater, which would normally run through the engine freshwater system to keep it cool, was not flowing at all. In the event, once found with Robin's help, the problem was obvious, and simple to fix. We had moved a generator as part of the bulkhead project, this had shifted slightly since last running the engine and jammed a pulley on the main seawater pump, which prevented it from running. A long running issue I've had has been that fuel was not being pumped from a diesel return tank which is installed below the engine. This Robin and I also got stuck into and fixed, though neither of us are sure exactly what caused the problem in the first place. We think it could either have been air leaking into the return pipe above the tank, something blocking the pipe which cleared when we uncoupled it, or something jammed in the pump itself. All in all, the engine and it's supporting systems are running perfectly fine now, though the engine, gearbox and turbo all need a good service sometime soon. I still have to give the engine room a good clean, and touch up the paintwork. Once that's done we'll be able to get the generators driven by the main engine back online. I've had a series of really excellent emails today, which cheered me up no end, including news from Captains Rick And Karen from the Wanderbird, which I'll write about in a separate post. Of particular interest this morning was an excellent email from Seb, which I have taken the liberty of pasting in it's entirety, adding only the picture which I took in December last year. I finally joined the 20th century and got me a computer, which due to being a century late I'm still fumbling with learning how to use. I thought I should start by mailing you to say that I've been following your blog with great interest. Your "seemingly impossible task" seems to be coming on brilliantly and I must say I find your blog entries inspire me in a big way to keep the faith going with our own impossible task. Robin may have told you about the gargantuan holes which he'd cut out of the plates on the bottom of the hull (something of an obstacle to her definition as a boat! ), well last weekend he began work on replacing said plates. Hooray! He's a real find, and so much more to me and Becky than a hired welder, he's becoming a guiding light in our quest to do the job proper with loads of good advice and support. Meantime the outside of the hull has been uhp blasted at an insane cost and it must be declared not to the highest standard, but never mind- its a beginning; and we've taken a leaf out of your book by starting work grinding all that nasty paint and scale out of the hull interior. Nasty job but it works doesn't it?. The tent aka the wendy house is holding well so far and was definitely worth every penny (rather a lot of them), the sound of the rain drumming against it both sounds wonderful and also serves to remind us why we built it. Certainly it keeps all the filth contained and therefore saxon wharf don't get upset but it's fulfilling the rather more important duty of enabling us to work in all conditions, like the worlds wierdest camping trip. I'm still only able to get at Wendy every weekend which means our time on the south coast is incredibly precious- which may explain why we haven't appeared at Lady Janes mooring to visit you just yet. This is a thing which may well change quite soon with new and different job demands and opportunities in my other life. I do hope so because I'm itching to see your epic project for real, as well as spend a lot more time preparing our iron lady for (one day) her return to the water. Good luck and I hope to be in better contact in the future with my new toy! I agree whole heartedly about the sentiments regarding Robin. 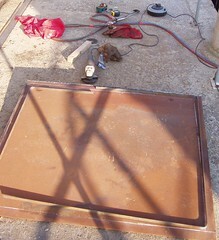 Work has at least started on the manufacture of my new hatch cover. So far I've got all the steel cut and the edges shaped. In theory, the next step will simply be to weld the edges, which will hold a rubber seal, in place. My experience with this sort of thing is that this is unlikely to go according to plan. It's just that I can't see where it could go wrong just yet. I'll keep you all informed as, with luck, I should get to welding it soon. This has got to be one of the most remarkable blogs I've seen: Expedition updates. 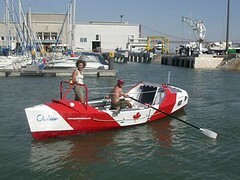 This couple are attempting to circumnavigate the world by human power alone. No matter how tough you are, reading it will bring a lump to your throat. Now all that's left to do on the rear deck is a final coat of non slip paint, I've made a start on cleaning up the steel on the foredeck. The priority is the hull, I know, but both the weather and tides don't always co-operate, so it's useful to have something else to do when the weather is right but the tide is not. 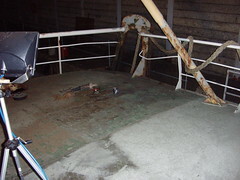 The pictures shows a late finish wirebrushing a section of the deck under floodlight. Truth be told, sometimes it's just easier to work on deck than over the side. At least the steel is in much better shape on the foredeck than the stern deck ever was, though there is quite a bit more to the foredeck. I'm fairly pleased with the results of my recent experiments with paints and insulation in the aft accommodation space. 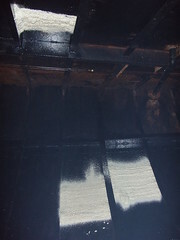 Here you see three separate trial patches of insulation, applied to the ceiling and to the spaces between the ribs which form the shape of the outer hull. Thirty three pounds worth (US$ 58.00) of insulation does not go far on Lady Jane, though buying in bulk will be considerably cheaper! As I suspected, the insulation did not stick to the 'tacky' bitumen which covers so much of the steel down there. What did work well, far better than expected, was coating the 'tacky' bitumen with bitumen paint, which dried out to a smooth finish. It took a while to dry out, mainly on account of the cold I suspect. The insulation I sprayed on the dried bitumen paint stuck really well, such that I can't prise it off without resorting to tools. Based the experiments I've done, I'm planning on coating any untreated, or rusty, steel with Rustroy, giving all the steel a couple of coats of bitumen paint then, after attaching all the wooden supports for the plywood skin, giving everything a good coating of insulation. In total I have space for up to four inches of insulation, though I suspect insulation that thick will prove to be very expensive so, depending on my progress and costs, I'll probably settle for around about two inches or so. Very soon I'll be one crew member short, as Fred and his lovely wife head off on their annual winter pilgrimage to Australia. 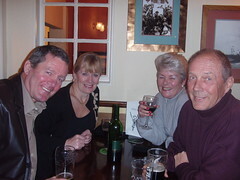 Here Malcolm and Pam join me in wishing Jenny and Fred bon voyage, down at The Castle In The Air in Fareham. There's no rest for me, as Malcolm has been fully cross trained in the arts of chipping, wire brushing and painting. I do envy Fred's escape to the warm weather for three months, though it won't be too long before I'll be able to escape to warmer climes with Lady Jane. Don't worry Fred, we'll save you some work for when you get back! I finally got round to giving the deck a good clean. This is something I should have done a long time ago. Here you see Fred carting the last of the stuff I've been keeping on deck onto the quay side, in preparation for hosing down the deck. We used the bilge pump, pumping seawater from underneath Lady Jane onto the deck which, along with a stiff broom, has made an incredible difference. The clean wood really shows up well, though I see a big caulking job ahead sometime soon. Looking at the piles of junk on the quay side I really need to think about throwing some of it away. My problem is though, I just can't bring myself to chuck out things that might be useful later. The next big cleaning job will most likely be the engine room, which really needs some attention. Another grim picture, I know. Rain and generally miserable weather gives me the opportunity to get going with the refurbishment of the aft accommodation space. I've been slow getting going with this, simply because I've been trying to get as much done on the outside as possible, and have not really had a clear idea of just how to go about this bit. I've mulled it over and now know I need to start with an outer 'skin' of plywood covering both the ceiling and sides. This outer skin will be over a layer of insulation. I'm also planning on replacing the floor, which is filthy and smells, hopefully lowering it a few inches to give me some much needed headroom. Anyway, before I can fit anything, the metal needs rust busting, treating and painting. As you can see from the picture, I've made a start on the ceiling which is straightforward enough, though a bit messy to do, the sides represent more of a challenge though. The basic problem I have with the sides is that a substantial amount of the steel is covered with a coat of bitumen, which is tacky to touch. Removing it will be very difficult, if not impossible. After doing boat insulation research on the internet, I'm intending to insulate the steel using spray foam insulation from Spray Insulation Ltd, but I don't think the insulation will stick to the tacky bitumen. I will try to seal the tacky bitumen with bitumen paint, which should hopefully set over the base, giving me a good surface to apply the insulation to. I also have a small experimentation pack of insulation on it's way, and will soon find out what works, else I'll need to come up with a different plan. Here you see Malcolm putting the finishing touches to the steering room. Malcom's help is greatly appreciated, and I hope he drops in to help more regularly now. It was through Malcolm that I met Fred who is now a regular member of the team who help with work on the boat. Malcolm lives just over the road from where Lady Jane is kept, so he keeps an eye on her for me. Just one more coat of the experimental anti-condensation paint on the ceiling of the steering room, which should get done in the next few days, followed by a coat of non-slip deck paint and the refurbishment of the steering room will be complete, for now. I just love these montages showing progress on Lady Jane. Being reminded of the work that has gone into a particular section gives me such a sense of achievement. Here you can see the progress on the wheelhouse so far. 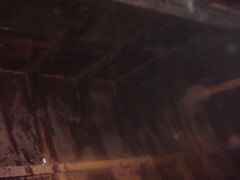 The three smaller insets show the cleaning up and repair of the two holes through which the drive shafts for the winches passed, right at the front of the wheelhouse. Particular thanks go to Robin, Pat, Jason and, of course, Fred who all helped in one way or another with this section. No time to rest on my laurels though, there is plenty more to do. I've made significant progress with the painting during these holidays. It must be said though, that I could never have achieved as much as I did without the help of Jason. He has been down to help before, so had a good idea of what he was letting himself in for. 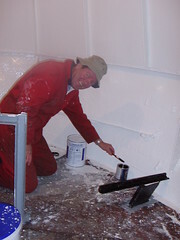 Here you can see him hard at work painting the stern handrails with a first coat of white. I just hope Kate will forgive me for returning him all covered in paint. That Hempel finishing paint is pretty impressive stuff. I never thought I'd see the day, but with just a first coat of white you can already see Lady Jane gleaming.